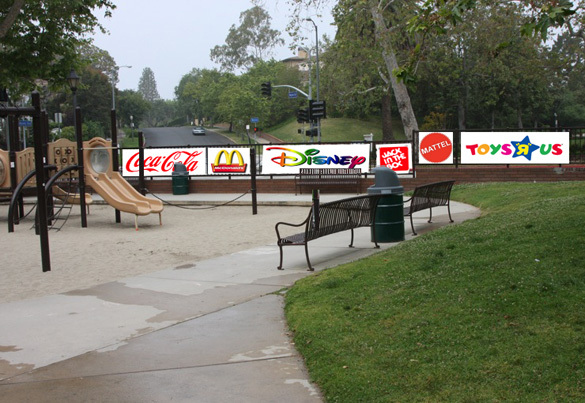 A great post over at Ban Billboard Blight about the move to allow advertising in Los Angeles Public Parks. Public/Private partnerships. At last weekâ€™s meeting of the L.A. City Councilâ€™s Budget and Finance Committee, the term kept bobbing like a life preserver grasped for by city agencies at risk of being drowned in a violent tide of red ink. Councilman Bill Rosendahl, speaking of the Recreation and Parks department, said that in the absence of such partnerships â€œweâ€™re not going to be able to sustain our parks, itâ€™s as simple as that.â€ The other committee members who spokeâ€“Paul Koretz, Greig Smith, and Chairman Bernard Parksâ€“all nodded assent to Rosendahlâ€™s declaration, apparently feeling no need to examine either its truth or its implications for the cityâ€™s future. …read the rest! Public/Private Partnerships: Will Commercialization Save Our City Parks? | Ban Billboard Blight. This entry was posted in News and tagged ad creep, bad deals, los angeles, public space. Bookmark the permalink. Post a comment or leave a trackback: Trackback URL.